ST. PATRICK'S DAY PACE & PINT IS SATURDAY MARCH 16TH. REGISTRATION IS OPEN! CHECK OU THE EVENT GALLERY FOR DETAILS. WE NOW HAVE SPIN CLASSES!!! COME IN CHECK OUT OUR NEW SPIN ROOM FOR SOME CYCLE FUN!!! 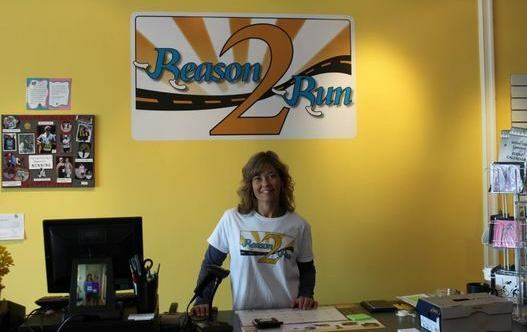 Reason 2 Run, located downtown Quesnel is a running specialty store with a wide variety of athletic footwear, apparel, accessories and NOW spin classes. Our great selection of footwear allows us to find the right shoe for your feet whether you are running, walking, or going to fitness classes. We will take the time to spend with you to find the one that fits just right. We also offer running clinics throughout the year for all abilities on and off the road. We have a great selection of apparel and accessories for all your runs whether they are short, long, fast or slow! However, we also have workout wear, yoga pants, yoga mats, water bottles, etc. All you need for that next event or goal! My Story and my Reason 2 Run! We all have our own" Reason 2 Run". It might not be the same reason each time but there's always a reason. When I started running 20 years ago it was to lose weight. A year after having a child I was the heaviest I had ever been. I had played team sports my whole life but never really enjoyed running. Not feeling confident enough to go to a gym and the time constraints of a family I decided to try running. At first I wouldn't have called it running but I was putting one foot in front of the other. I quickly realized my body was stronger than I thought. The self satisfaction was more than I expected. It made my bad days seem better and my expectations for tomorrow greater.Running is something only you and your body can do. That's what makes it so gratifying to reach your goals. When I signed up for my first event that is when I really realized a runner comes in many different sizes, variety of ages and ones that are fast and slow. I have been happy being somewhere in the middle. I have completed many events over the last 20 years from 5k's to Ultra 50km Marathons. I share my passion of running with anyone that will listen hoping to inspire at least one and encourage them that they are stronger than they think. And if you think you can't do it alone join a group as I always say there is "strength in numbers". So whether you are running from a bad day or running to a new tomorrow you will always have a "Reason 2 Run"! take you to a new tab. Find your "Reason 2 Run"